The recent trips to the United States by Prime Ministers Nawaz Sharif and Narendra Modi provide ample evidence of India’s and Pakistan’s divergent trajectories. Nawaz arrived with no fanfare, a known commodity in familiar trouble back home. He delivered a lackluster speech at the U.N. General Assembly notable only for dwelling on Kashmir, which has always been a harmful issue for Pakistan. Nawaz met with Vice President Biden in New York along with a few foreign leaders (at their request), and then left for home, where he faces unrelenting political opposition. Modi arrived in New York as an ambitious, contentious, and intriguing figure with an electoral mandate to revive India’s fortunes. He spoke proudly in Hindi, promised much with few specifics, and met with a rapturous crowd of Indian-Americans at Madison Square Garden. Then on to the White House, long meetings with President Obama, and a fancy dinner during which the guest of honor fasted. Love him or hate him, Modi is a charismatic leader who has everyone’s attention. Pakistan has previously been led by a charismatic leader, Zulfikar Ali Bhutto, who disappointed badly. Nawaz does not need charisma – he needs to rouse himself to lead, or step aside to let his most capable Party members do their best to reverse the country’s decline. If he is incapable of both, Pakistan could find itself with another charismatic figure unable to govern effectively. One of Nawaz’s primary tormentors has withdrawn his parliamentarians rather than offering new legislative initiatives. The other calls for a revolution. Modi offers hope to his electorate and to the Indian diaspora. Nawaz’s record does not engender hope. Modi and Obama signed off on a vision statement. Nawaz has always lacked vision. He builds motorways, but to his credit, he is doing more to improve power generation than the previous, lackluster civilian government. 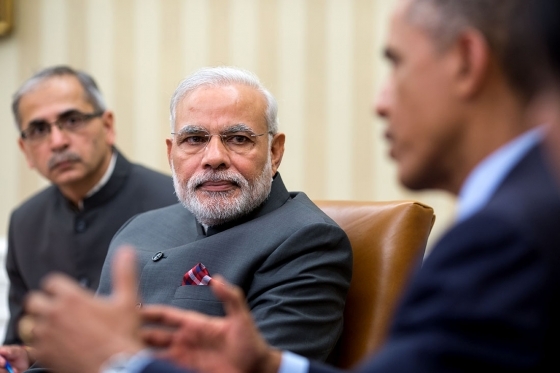 The U.S.-India joint statement was suffused with promises. U.S.-Pakistan relations can do without lofty promises, since the past is littered with them. It will suffice if both Pakistan and the United States can work in tandem through the difficult security dilemmas they have co-created. Dynastic politics aren’t limited to South Asia, as is evident by the Clintons and the Bushes. But dynastic politics have had extremely punishing effects on the subcontinent, hollowing out major political parties and saddling Pakistan and India with ill-functioning governments. Democratic elections do not offer opportunities for new starts when the two primary choices are both family-run political enterprises. While Pakistan struggles with this dilemma, India enjoys the promise of renewal because one of its two national parties is not beholden to a dynastic franchise. Modi’s government, by all appearances, is a one-man show. Other performances of this kind on the subcontinent have not ended well. Some leaders with electoral mandates fail for lack of ambition, as Nawaz is now doing. Others fail by overreaching badly enough for political rivals to recover. In Modi’s case, there will be dynamism whether he succeeds or fails. Divergent trajectories on the subcontinent have significant ramifications for the nuclear competition and for the Kashmir dispute. As Pakistan falls increasingly behind India, it increases reliance on nuclear weapons to shore up shortcomings. This is an understandable but questionable strategy, since nuclear weapons cost money without providing usable military capability. The dangers inherent in any nuclear competition can be mitigated, however, if stockpiles are well secured, if crises are avoided, and if disputes are being amicably resolved. The stewards of Pakistan’s nuclear arsenal are serious, competent, and numerous — as was the case in the former Soviet Union. Despite its military might and large nuclear stockpile, the Soviet Union collapsed because of poor governance, internal strains and economic failure. At the end of the day, nuclear security is only as strong as the society and the economy that nuclear weapons are meant to defend. Nor are their signs of the amicable resolution of grievances on the subcontinent. Just the opposite is true, as is evident by heavy firing along the Kashmir divide. Divergent national trajectories may make reconciliation between India and Pakistan harder. Modi’s government has sent out mixed signals about wanting to engage Pakistan, but showed little sense of urgency in resuming bilateral talks, and pulled the plug prior on a meeting of the two Foreign Secretaries because of haggling over Kashmir. There was no private meeting and not even a handshake on the periphery of the UN General Assembly, where Nawaz dusted off proposals for a plebiscite to resolve the Kashmir dispute. Not surprisingly, firing across the Kashmir divide accompanied diplomatic jockeying over the Foreign Secretaries meeting and greatly intensified after the UN speeches. Pakistan has prided itself as a bulwark against Indian hegemony. Its national security policies have rested on the assumptions that India cannot become a major power without addressing Pakistan’s grievances, and that New Delhi is dependent on Pakistan’s help to gain access to Central Asian markets. Both assumptions are increasingly suspect. Well before Modi’s election, Indian strategic thinking was gravitating toward a strategy of indifference toward Pakistan and betting on markets in East Asia rather than Central Asia. The instruments employed to “tie down” India in South Asia have done more harm to Pakistan than to India. Pakistan’s standing and economic prospects have been greatly diminished by keeping Kashmir on the boil and by not clamping down on groups that carry out dramatic acts of violence in Indian cities. India and Pakistan have a common interest in de-escalating the violence across the Kashmir divide. But more troubles lie ahead unless New Delhi places a higher priority in engaging Pakistan. Being left increasing behind India is bad enough for Pakistan’s national security decision makers; an Indian posture of indifference adds insult to injury. It might take a Nobel Prize ceremony and the intercession of a teenager to put relations back on an even keel, at least temporarily. International and grassroots peace groups are continuing to urge strong action to defuse the escalating tension between Pakistan and India over Kashmir – mostly out of fear for an “accidental” launch of a nuclear weapon. India and Pakistan’s nuclear arsenals pose a considerable threat considering the volatility of their relationship. Over the past few months, the conflict in Kashmir has escalated and erupted in horrific violence and could turn into a hotbed of nuclear attacks. The Kashmir conflict poses a geopolitical threat because Pakistan’s role in Afghanistan will be hindered, economic ties in the region are likely to remain frail and we cannot idly sit as two nuclear powers fight over Kashmir. It would be in the best interests of both India and Pakistan to engage on a more cooperative relationship; unfortunately, ideologies (there are fundamentalists on both sides)stand on the way and not even the risk of another ruinous war can nudge both parties into reason. The ‘India-Pakistan’ western viewpoint fundamentally ignores, either deliberately, out of ignorance or laziness, the fact that India is status quoist. Pakistan is not, and has never been . In this regard, this article breaks no new ground at all; it just recycles the same old. Pakistan has an issue. India has issues with Pakistan creating an issue. The current border firing escalation is simply a change in calibration of the Indian treatment of Pakistan. Peace through negotiations does not work. Therefore, as India widens the gulf, it will simply resort to the more logical choice : Peace Through Strength . An American ought to recognize this approach. It’s the classic shift that also occurred in your policymaking from Carter to Reagan. Modi simply happens to be an Indian Reagan in more ways than one. The IT systems of all Russian nuclear weapons stockpiles will be protected by a new team of anti-hackers, the Defense Ministry said after a year-long “hunting season” for programmers. Special units of the Russian Strategic Missile Forces (SMF), responsible for the country’s nuclear weapons, will reduce the vulnerability, should it be found, in their brand-new information systems, according to the Defense Ministry’s spokesman. Let us not forget that Kashmir is the issue which fuels insurgency. And despite that Pakistan is now in its 12th year in “War on Terror” or clamping down against the groups which carryout acts of violence. But has this yielded any positive results on negotiations? Leave aside Kashmir, which of course is a complex issue, what about Siachin and water issue? Absolutely zero progress when it comes to negotiating the issues. From 2002-2008 no major terrorist attack took place but what was the progress made on issues?? Zero. From 2009-2014 again no major terrorist attack but the negotiations are still stalled? Are we waiting for another incident? What is the time frame to initiate a meaningful dialogue after a major terrorist attack/incident? 50 years? It just reflects Indian government is just not serious in finding any meaningful solution about the issues between these two countries, terrorism is just a curtain which provides them with a pretext to avoid dialogue. It would just strengthen the rhetoric of radicals and general public’s perception towards the futility of dialogue which in turn would fuel the sentiments towards militancy. “Mr. Modi is apparently living up to his promise of taking a tough stand against Pakistan. Not only has the Indian government pulled out of the secretary level talks recently, besides ruling out the possibility of third party mediation on Kashmir, but has also reiterated that there will be no dialogue until cross border firing continues. This policy illustrates that the incumbent Prime Minister, on one hand, is closing the opportunities of resolving lingering disputes through meaningful dialogue, but is also exerting pressure on Pakistan through military coercion and diplomatic rhetoric. Such imprudent policies would obviously strengthen the perspective in Pakistan about the futility of the dialogue process with India, which is going to compound the problems in the region. ” Kashmir is the issue which fuels insurgency.”, Nope it is not. Pakistan as it is now, is a compromise state between multiple power groups, should Kashmir issue be solved the most hit would be the Rawalpindi and the Jihadi hydra that Rawalpindi backs. There are economic implications of this, as most services group are directly controlled by ex generals. Coming to Siachen all it take to solve this issue is for Pakistan to verify the ground location of its current troops and India do the same instead Pakistan wants an unconditional withdrawal, why would India give up its strategic initiative India hasn’t forgotten Kargil yet. Last but not least water, last time I checked there was a dispute mechanism under the Indus water treaty which Pakistan seems to have used almost exclusively till now. Infact most pakistani leaders blame Pakistan for its lack of water management than India for anything. India knows what it can do under the Indus water treaty and what it cannot, would it waste 2 billion$ to put up a dam in case court of arbitration asks it to cancel its plans. “From 2002-2008 no major terrorist attack took place but what was the progress made on issues” So if thats the game most Pakistani think it will to make India come to the table you are sadly mistaken, it clearly shows your propensity to resort to violence as an instrument of state policy, its seems to have worked miracles during operation searchlight. “Modi’s hatred for Muslims in general and Pakistan in particular, is an open secret” that would be the thing I would expect something from a very popular geopolitical Analyst ” Mr Zaid hamid” train of thought. Adding to that in today’s pakistan most Muslims kill each other than any one killing muslims in India. Early in the winter of 1958, Du, 23, then a hoist technician with a mining machinery factory in central China’s Luoyang, Henan province, left his pregnant wife for a mission unknown. He was on a train heading west with several dozen colleagues. None of them knew what the exact destination was. “All I knew was to go to the front,” Du told Xinhua. After almost a whole day on the train, they were transferred to trucks, which carried them through barren grassland for another two days. When they finally stopped, men were at a place known to locals as Jinyintan, which covers an area of more than 1,100 sq km and features plains surrounded by mountains on the Qinghai-Tibet plateau.